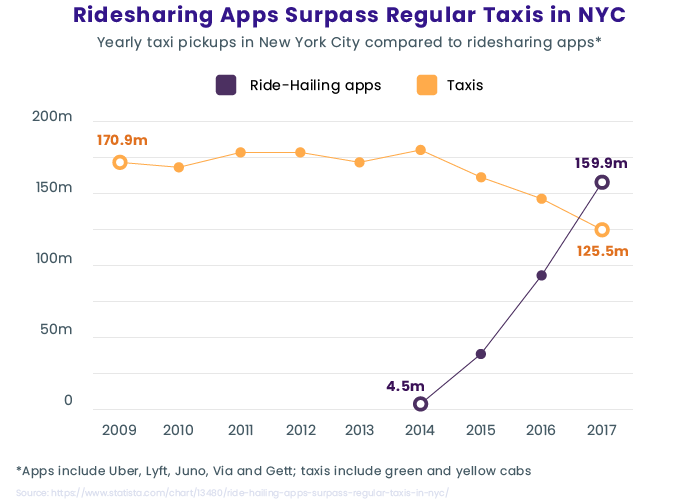 Did you know that in 2017, taxi apps including Uber and Lyft surpassed regular taxis in New York City by number of rides? 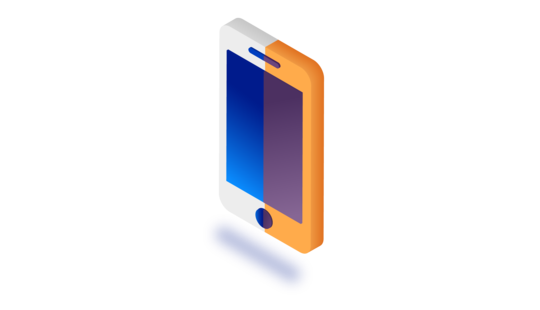 We’ve decided to take a look at this opportunity from a software developer’s standpoint and uncover the secrets of taxi app development. 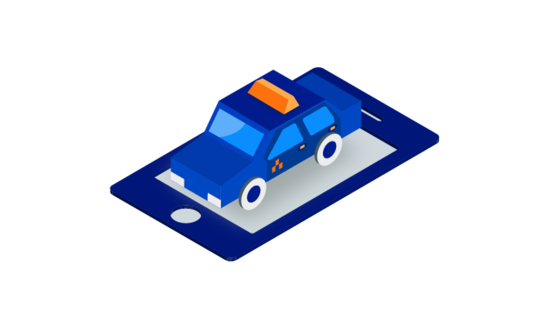 In this post, we share key features of a taxi app, possible development challenges, and a Business Model Canvas for an app like Uber. The concept of taxi apps is quite simple. A rider enters a destination and confirms their location. After that, the app matches the rider to a nearby driver. These apps include payments, GPS tracking, and customer support as well. Now let’s take a look at key players on the global online taxi market. With 75 million riders and 3 million drivers, Uber is one of the most popular ridesharing apps. It operates in more than 600 cities in 65 countries. Today, Uber’s main competitor is Lyft, which is available in the United States and Canada. According to Second Measure, as of October 2018, Uber and Lyft combined owned almost 98 percent of the US ridesharing market. But while Uber led by market share, Lyft showed faster growth. Curb is available in the US. Unlike Uber and Lyft, which let passengers share a ride in a private car, Curb allows riders to book professional and insured drivers. Grab serves a number of countries in Southeast Asia. Grab services include GrabCar and GrabTaxi, so a user can ride either in a licensed taxi or in a private car. Grab also offers food delivery and pet transportation services. Taxify operates in over 30 countries and has more than 15 million users. It has managed to get more active users in Africa than Uber. mytaxi operates in nine European countries. More than 100,000 licensed taxi drivers and 10 million riders use the mytaxi app. Ola is an Indian ridesharing company. In 2018, Ola expanded to Australia and New Zealand. Generally, a taxi app has three types of users: admins, drivers, and riders. Let’s consider the core features each user requires. These are the features that are necessary for a minimum viable product (MVP). 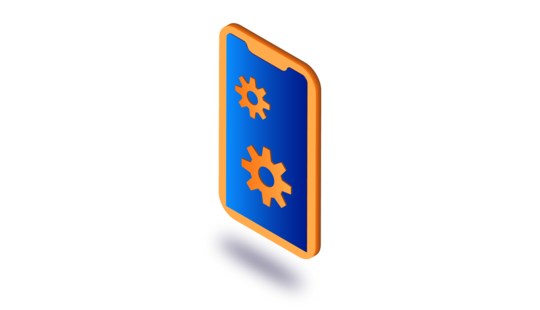 Admins get the features that allow them to easily manage, moderate, and track drivers and riders. Dashboard allows an admin to view statistics on users, rides, and earnings. Reports and analytics. Admin should be able to see various reports, including driver reports and payment reports. God’s view. This feature enables an admin to see all the cars on the map as well as manage drivers, vehicle types, riders, reviews, locations, and fares. Drivers get the ability to manage their personal profiles, rides, and payments. Map. A driver can see the route of the ride, pickup location, and destination on the map. Notifications. A driver gets notifications about requests for a pickup, canceled rides, and new messages. Call riders. To contact riders, drivers should be able to telephone call riders. Rating system lets drivers rate riders when a ride has ended. Fare calculator allows a driver to see how much a ride costs. Riders should have the ability to manage their personal profiles and payment methods. Map. Riders can pick a destination, set a pickup location, track a driver’s real-time location, and see the route of the ride on the map. Book a taxi. Once a rider has entered a destination and confirmed their location, they can book a taxi. Call a driver. Riders should be able to contact a driver. Estimated time of arrival. This feature allows riders to see when a driver should arrive. Notifications. Riders get notifications about arrival, canceled ride, and new messages. Fare calculator. Riders can see a fare estimate before booking a taxi. Rating system lets riders rate drivers. Reviews. Riders should be able to leave feedback about drivers and rides. What are the challenges of developing a taxi app? If you want to develop a taxi app, keep in mind that ridesharing services face certain challenges. Safety is our top priority and it is our goal to make every ride safe, comfortable, and reliable. Safety is a challenge for taxi apps, but it’s an absolute must. The biggest task is to make rides safe for both drivers and riders. Uber and Lyft require potential drivers to undergo background and driving record checks. Drivers also must provide auto insurance and a driver’s license. 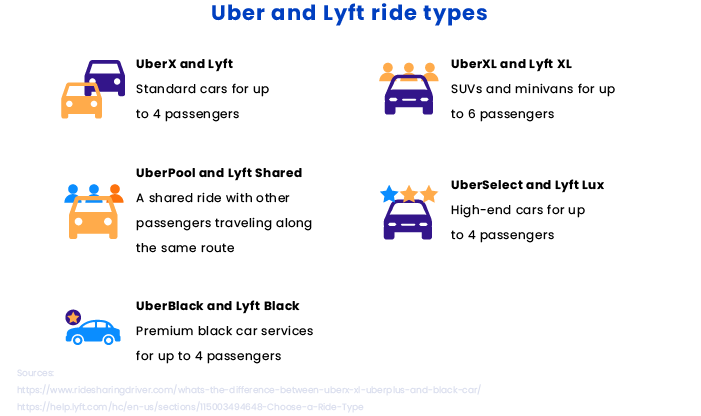 To make sure riders are safe and comfortable, both Uber and Lyft have certain vehicle requirements (which vary by city). For instance, Uber requires a vehicle to have four doors and be no more than 15 model years old. Vehicles can’t have any damage or missing pieces. Also, Uber allows drivers to use rental cars only from approved rental agencies. As a safety measure, Uber has added an emergency button to the app. With this safety feature, users can quickly contact 911 directly from the Uber app by pressing a single button. When you build a taxi app like Uber or Lyft, be ready to compete with big market players. To avoid big competition, you might want to consider picking a niche. Picking a niche and targeting particular users can increase your chance of success. Shebah. An Australian ridesharing service for women that has only female drivers. HopSkipDrive. Created by three moms, HopSkipDrive is a car service for children. It allows parents to schedule and track rides for their children. Taxi Electric. A premium electric taxi service that operates in Amsterdam, the Netherlands. A taxi platform is a two-sided marketplace. That means there are two types of users — drivers and riders — who benefit from each other. Riders simply won’t use a taxi app if there are no drivers. And here’s the question: who should you attract first? It’s the chicken and egg problem most marketplaces face. Let’s see how Uber solves it. When Uber launches in a new city, the company starts with reaching out to professional drivers. To attract drivers, Uber offers minimum earnings guarantees. Thus, drivers get paid even if they don’t transport any riders. To attract riders, the company offers discounts and coupons. Users can even earn free rides for inviting friends to sign up. Giving bonuses is an effective way to attract new drivers and gamify the process. Both Uber and Lyft offer driver bonuses for completing a certain number of rides. 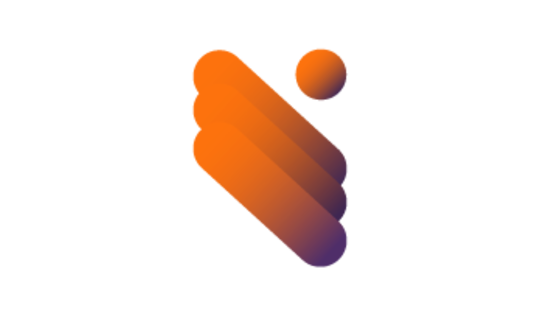 If you want to expand to a number of different cities and countries, you may face some localization challenges. Note that localization isn’t limited to translating a taxi app into a different language. First of all, there are different currencies. Fare estimates must be displayed in the currency of a particular country. Second, the ride options may vary. For example, Uber offers an auto-rickshaw service in India and UberBOAT in Croatia. That means that you should consider the target audience’s needs and problems each time you expand to a new country. Taking all of that into account, you may need to make some changes to the app interface to adapt it for a new city or country. 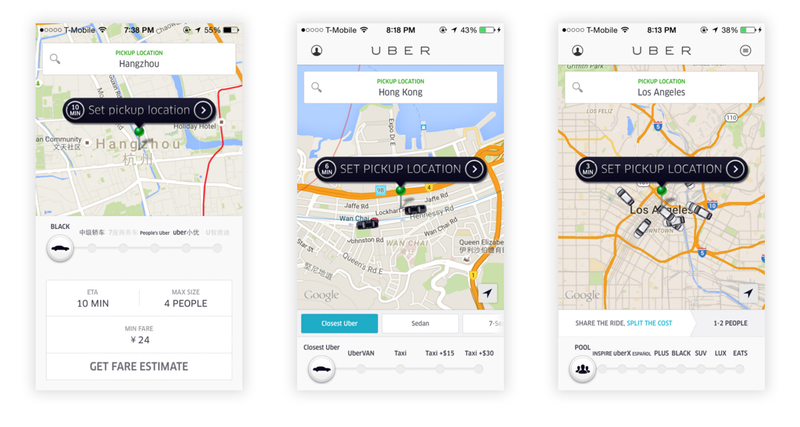 If you compare Uber’s interface in different cities, you’ll notice that it looks slightly different. The changes are mostly related to differences in ride options. Though even when ride options are the same, they’re sometimes rearranged. How do taxi apps make money? Let’s take a look at the most common revenue streams for a taxi app. Taxi services generate revenue primarily by taking commission for rides. Services like Uber don’t own cars. Instead, they pay drivers as independent contractors. Each transaction is divided between the driver and the company. Both Uber and Lyft take about 20 to 25 percent commission from each transaction. Drivers get the remaining 75 to 80 percent of the total fare. When demand for taxis in a particular area is high, prices for a ride automatically increase. Both Uber and Lyft use this pricing strategy. In the case of high demand, the price will be based on the number of available drivers and requests. Uber and Lyft provide several car services to meet the needs of different audiences. The better the car, the higher the price for a ride. Uber provides several options, from UberX with regular sedans (about 80 percent of all Uber rides) to UberBlack, which is Uber’s most expensive luxury service. There’s also UberXL, which can seat up to six passengers and costs more than UberX. Uber also offers an option for shared rides called UberPool, which is cheaper for riders while letting Uber collect more revenue on each trip. Lyft provides similar options. There’s the regular Lyft service, Lyft XL, Lyft Lux, Lyft Black, and Lyft Shared. A Business Model Canvas is used to visualize a startup’s business model, evaluate the business idea, and figure out if the product meets the needs of its target audience. Here at RubyGarage, we use the Lean Canvas – a slight modification of a Business Model Canvas – to evaluate our clients’ business ideas. You can read about the Lean Canvas and our approach in this article. 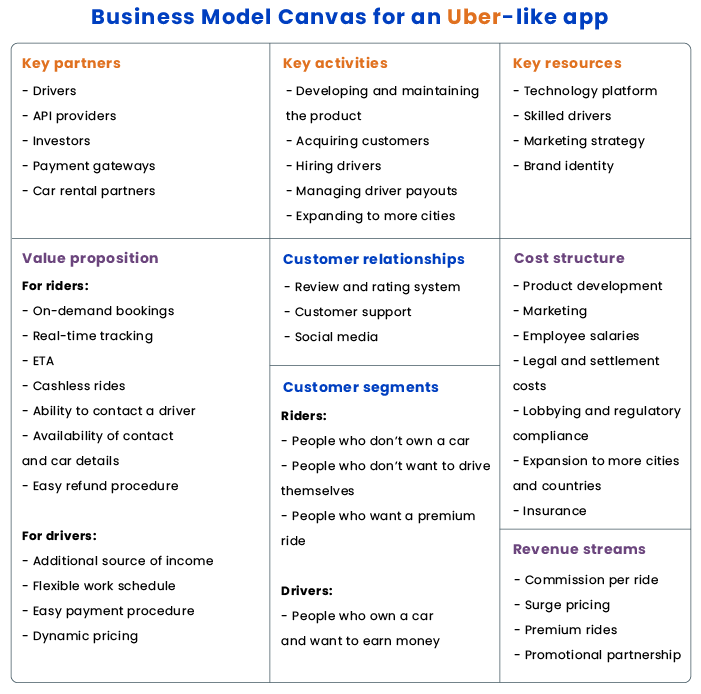 Here’s an example of a Business Model Canvas for Uber. Want to develop your own taxi app? Contact us to discuss working together!